The Government of India canceled the foreign funding license of senior human rights activist Shabnam Hashmi's NGO, Act Now for Harmony and Democracy (ANHAD) last week, on the basis of “field agency reports” which suggested that it carried out its activities against “national interest”, but it gave no supporting evidence. 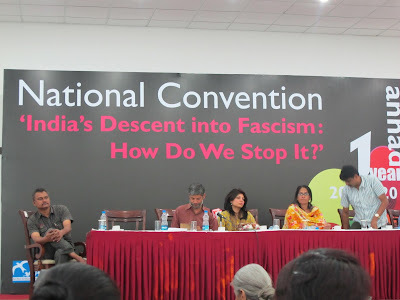 An Indian socio-cultural organization established in March 2003 as a response to 2002 Gujarat riots, ANHAD's Foreign Contribution Regulation Act (FCRA) license was reportedly canceled along with that of Ahmedabad-based Dalit rights organization, Navsarjan Trust last week for carrying out what was called “undesirable activities aimed to affect prejudicially harmony between religious, racial, social, linguistic, regional groups, castes or communities”. ANHAD is proud to join this roll-call of India’s dissenters against the communal, anti-Dalit, authoritarian and anti-poor government of the day. It is important to underline that no official list of these organizations has been released by the MHA, making what should have been a transparent and democratic process even more opaque and arbitrary.